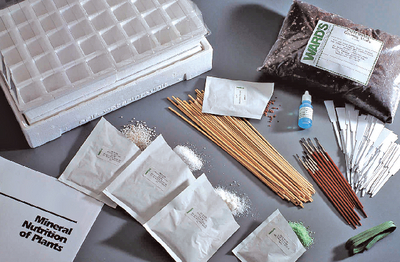 This kit includes a comprehensive investigation for examining various aspects of plant growth. This all-inclusive lab activity uses Rapid Radishes to help teach plant-growth concepts. Students learn the importance of nutrition by exploring the synergistic effect of nitrogen, phosphorus, and potassium on plants and the importance of appropriate levels of fertilization. Additional labs cover problems caused by mineral deficiency, fertilizers, the difference between macronutrients and micronutrients, range, contamination of groundwater by leachates and surface water by runoff, and hydroponics. The kit includes a self-watering seed starter tray, Rapid Radish seeds, all necessary propagating materials, a growing guide, a teacher’s guide, and a student copymaster. Ordering information: This kit includes a self-watering growing system, nitrogen fertilizer, phosphorous fertilizer, potash fertilizer, and Rapid Radish seeds.